Like this? Buy an app! This is a two player game; the objective is to survive your opponent. Player 1 (P1) controls the 'C', representing a spaceship, and his opponent (P2) controls the 'E'. Ships are destroyed by collisions with one another, planets (immobile objects), asteroids, and torpedoes. 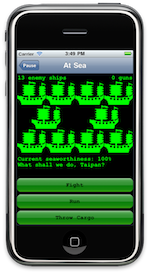 Each player can set his ship's direction and speed, and fire torpedoes. Ship direction can be set to one of the four cardinal directions, and ship speed can be set to full stop, full speed, or flank speed. Players share a single keyboard; P1 uses the left side of the KB, and P2 the right. Controls are summarized to the left of the playfield. Note that torpedoes take about 2 seconds to reload, and can be fired no more rapidly than that. If the game appears 'frozen', try tapping the spacebar. The original game was written by Scott Adams, and, as far as I know, he retains copyright to the machine code. The original hardware was built by Richard Adams. The heart of the computer was the National Semiconductor IMP-16 chipset.